With the assistance of a highly skilled architectural design team, Carroll works closely with numerous veteran and law enforcement associations to design, fabricate and install tribute monuments throughout the country. We are incredibly proud of the work we have done to pay honor to our nation’s heroes. In addition to monuments dedicated to veterans and law enforcement, Carroll Memorials works with various organizations to create civic memorials dedicated to specific causes or moments in history. Fraternities, sororities, schools, churches, religious associations, civic associations, historical associations, and many others have had their dedication monuments expertly crafted by Carroll Memorials. Carroll Memorials has a coordinated team of landscape architects, designers, memorialists and installers who work together to create both small and large scale monuments. We handle every aspect of the project from design to installation. The design process is catered to each individual monument to ensure a smooth process, excellent design, and timely installation. We treat each monument with the same care regardless of size or budget. The materials available in monument design are endless. 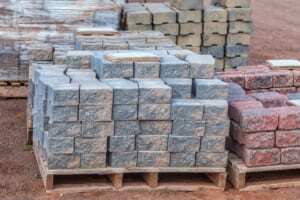 Ranging from small natural stone to large-scale bronze sculpture, some of the more popular options are granite, bronze, fieldstone, slate and brick. Due to our extensive relationship with both domestic and international granite and bronze companies, we have access the highest quality materials at reasonable prices. Once a design has been approved by the client, Carroll’s memorialists and team members work to complete the monument in a timely fashion. Carroll is involved each step of the way to ensure the work meets all expectations. 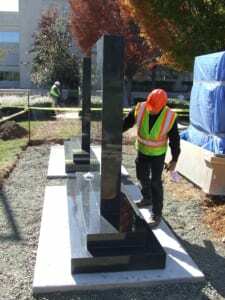 From site preparation, to the installation of the monument, to final landscaping, Carroll handles all the details in a professional and safe manner. 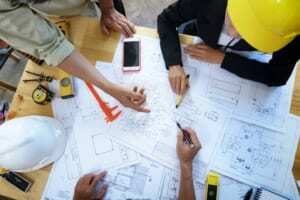 We work closely with local officials to make sure all aspects of the job are completed correctly the first time, thereby avoiding frustrating and costly delays. Clients are kept up to date throughout the process so there are no surprises. A representative from Carroll Memorials is onsite to ensure the job is completed to 100% satisfaction. When installation is complete, Carroll takes great care to leave the area ready for the dedication ceremony. Do you have questions about selecting a memorial, monument or signage? Don’t hesitate to contact us for more information.